The projects that comprise ARPA-E’s MARINER (Macroalgae Research Inspiring Novel Energy Resources) program seek to develop the tools to enable the United States to become a global leader in the production of marine biomass. Presently, macroalgae, or seaweed, is primarily used as food for human consumption, but there is a growing opportunity for the production of macroalgae for use as feedstock for fuels and chemicals, as well as animal feed. ARPA-E estimates the United States has suitable conditions and geography to produce at least 500 million dry metric tons of macroalgae per year. Such production volumes could yield about 2.7 quadrillion BTUs (quads) of energy in the form of liquid fuel, roughly 10% of the nation’s annual transportation energy demand. MARINER project teams will develop technologies capable of providing economically viable, renewable biomass for energy applications without the need for land, fresh water, and synthetic fertilizers. Such technologies include integrated cultivation and harvesting systems, advanced component technologies, computational modeling tools, aquatic monitoring tools, and advanced breeding and genetic tools. Successful technologies must help greatly reduce the capital and operational expenses related to macroalgae production and enable significant increases in farm size and potential areas of deployment. 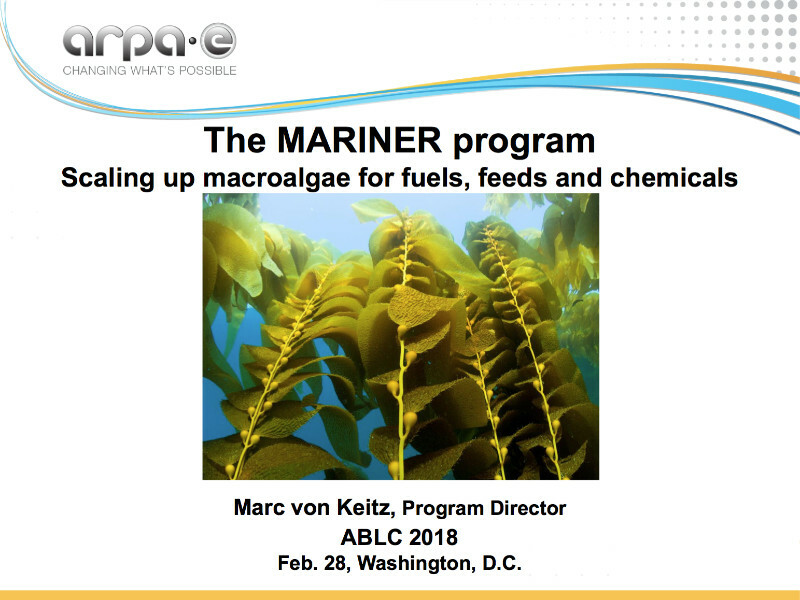 ARPA-E’s Marc von Keitz gave this illuminating overview to the MARINER program and its promise and progress at ABLC 2018 in Washington DC.